Durlston Country Park and Nature Reserve is located on the south coast of Dorset just outside Swanage. I was fortunate enough to be a regular volunteer at Durlston for more than 2 years. This shot was taken on a brief return visit in July of this year, with a Canon EF 100-400mm lens and a bit of luck. Two peregrines fledged in the area this year and could regularly be seen from the coast path over the summer – alternately terrorising the nesting seabirds on the cliffs below and testing their new wings in mock aerial combat with each other, and with their increasingly unamused parents. 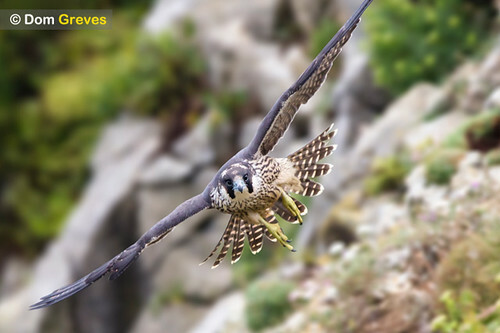 This entry was posted in Isle of Purbeck, Photography, Wildlife and tagged competition, durlston, peregrine, photography, wildlife by Dom. Bookmark the permalink.